Fueled by fast growth, and high demand for its systems, Post Process Technologies (PPT) has selected Buffalo, NY-based Keller Technology Corporation (KTC) as its contract manufacturing partner. 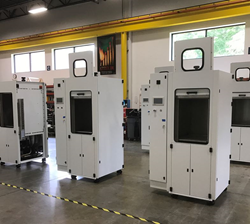 PPT, also located in Buffalo, is a leading provider of automated, intelligent solutions for post-processing of 3D printed parts, while KTC specializes in custom automated equipment and industrial contract manufacturing services. Post Process Technologies offers a variety of patent-pending systems that use a combination of hardware, custom software, and proprietary chemistry to efficiently automate the post-processing – removal of support structures and surface finishing - of parts created via additive manufacturing techniques. “This partnership plays towards the strength of both companies,” says Robert Paschka, VP/GM at Keller, “PPT will concentrate on its core competencies of research, design and marketing of their leading-edge products for the additive manufacturing industry, while KTC brings to the table its expertise and many years of experience as a machine builder and contract manufacturer of turnkey industrial equipment." Learn more about Keller Technology Corporation’s custom contract manufacturing solutions.